Probably the most common cable joiners in the digital video security systems industry are BNC connections. BNC connectors are easy to use and ensure a sound, full contact connection. BNC connections are different than most other single pair wire connectors (such as RCA plugs, for example) plugs, becuase BNC connections are “locked” in place. The following article is about the origin and use (including applications) of BNC Connections. BNC is an acronym for this type of radio frequency connector. 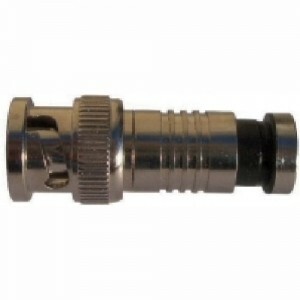 The connector is designed for use with coaxial cable and is generally used for radio, television–including digital video camera security systems, and other radio-frequency applications. BNC stands for Bayonet Neill-Concelman. Bayonet (“B”) represents the the type of twist locking system that holds the connectors together. Unlike RCA plugs that just push together can be subjected to accidental disconnection, BNC connections are locked together in the same twisting lock configuration as that of a gun bayonet. Generally, BNCs do not become disconnected unless they are purposely untwisted from the locked connection. The “N” and “C” in BNC stands for the first letters of the last names of the two men that invented the connector; Paul Neill and Carl Concelman. However, origin for development lies with Octavio M. Salati, a graduate of the Moore School of Electrical Engineering (of the University of Pennsylvania). In 1945 Salati filed for a patent for a coaxial cable connector that would minimize wave reflection and/or loss (one of the primary attributes of a BNC type connector). Another feature of the BNC connection is that the connectors are available to match the impedance of the cable they are connecting. Generally, there are two major types of BNC connections based on impedance, 50 and 75 ohm versions that are used today. There are also many variations that originated from the BNC design. These include the SR-50 and SR-75 Russian copies whose dimensions differ slightly from the BNC because of converting the measurements from English (Imperial) units to metric. There is also a Threaded Niell Concelman or TNC connector that displays superior performance over a BNC for microwave applications. The BNC connection consists of two separate pieces, the “female” and “male” ends. These ends are firmly and permanently attached to the shielded coaxial cable. The male end consists of a center (usually) solid copper core wire with the metal shield or mesh that surrounds the cable completing the single pair wire connection. The male connector is pushed into the female connector and twisted, making the single pair connection and locking the connection at the same time. There are also different types of BNC connections based on how the actual connector is attached to the cable or provides adaptation to a BNC connector. Security Camera King offers a variety of BNC connectors on their on-line store catalog. They may be found at http://www.securitycameraking.com/surveillance-camera-connectors-188-ctg.html or by clicking “Security Camera Accessories” the “Surveillance Camera Connectors” on the left hand side of the home page. Security Camera King offers three different types of BNC connections base on how the connector attached to the cable it is attached to and not the actual connection between BNC pieces themselves. In addition, more many connectors they offer a single unit price and a 100 unit price. The first of three is the crimp-on connector. This connector requires the use of a crimping tool to secure the banded necks of the BNC to the coaxial cable. They are referred to in our catalog as “2 Piece Crimp-on BNC Connector). These are fairly easy to work with, and when installed properly, including being crimped properly, these provide a fair to good connection. This BNC requires the use of a special crimping tool. The second is the twist-on connector. They are referred to in the catalog as “BNC Connector Twist-On.” This BNC connection is easy to install (just twist or screw on the cable ends) and requires no special tools. These connectors hold fairly well and provide a fair to good connection. Screwing the connectors onto the cable ends can actually be a little difficult though. The third type is a compression connector. They are referred in the catalog as BNC Compression Type Connector.” These connectors require a compression crimping tool (also sold by Security Camera King) and provide an excellent connection and are easy to work with. In addition to BNC connections, there are many other adaptor and connector types available for purchase on the Web page listed above.